I have a little “shiur” each Sunday with my grandsons. I looked for a set of books which were considered better than “little midrash says”. Short enough to keep their attention and informative. It’s been fine, and I notice that the pictures are a great incentive for their concentration. One grandson today, after I mentioned that Sarah was hidden in a box by Avraham, (Sorai, Avram), asked me “where is Sarah”. I said she’s in the box in the illustration. He persisted but where is Sarah. There are pictures of Avraham, Moshe and Yehoshua etc and admittedly the illustrators tended to not show faces of these people, but it dawned on me that women seemed to have disappeared from every Parsha as far as illustrations were concerned. Now Sarah was good looking. That’s why she was hidden. That’s essential to the story. How you capture that in an illustration is not my problem. The solution however is heavy-handed. The other ridiculous aspect is that everyone seems to have peyos. From where do they know this? Ironically the evil people during Noach’s time, look like common criminals in our time. Chaim and Lipsha Soloveitchik. He didn’t even call himself HoRav, even though he was undeniably one the Torah geniuses of all generations. A little story regarding the depiction of the truth. 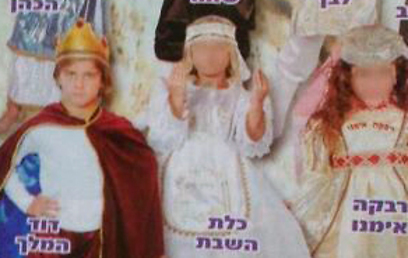 Some years ago, I came across a story booklet, in Hebrew, from Chabad. It told of how, in the late 1950’s, Rabbi Chaim Gutnick ז”ל was sent by the Lubavitcher Rebbe to Adelaide for the Yamim Noraim, with specific instructions to ask after the Egyptian Jews there, and how he saved a young Jewish girl from being converted to Christianity. The booklet is illustrated, and one of the illustrations depicts Rabbi Gutnick with a full beard! You and I both know, of course, that Rabbi Gutnick only grew a beard at some point during the 60’s. Many so-called rabbinic biographies tend to bend the truth, so your parsha book is doing no more than its adult counterparts. You can hear the story from the בעל המעשה in this clip: https://www.youtube.com/watch?v=aAzqozrlgSI (and subsequent parts). “Say no to Ultraviolet”. Under this heading parents were protesting in recent weeks, requesting to return to the Bnei Akiva “of the good days” [Chadesh Yomenu K’Kedem]. The protest involved a phenomenon well known to many branches of Bnei Akiva around the country on Saturday night. When girls go up to dance, the lightings are turned to ultraviolet so that the girls will not be seen by the men, this together with a more creative solution called ‘dancing silhouettes’, when the girls are dancing behind a white sheet, or dancing the “dance of street lights” that have become fashionable in recent years. “It is unthinkable to darken a hall when [girls] aged 9 are dancing” say the girls’ parents. We can copy the faces from the “Birds Head” Haggada. No blotting will be necessary. In Sefer Bereshit we have accountings how mankind was created. In chapter one, woman and man were created at the same time. They lived in harmony. In chapter two, at first only man was created, but G-d said: Lo Tov Heyot Ha’Adam Lvado. Men and women should share the world together. It surely does not mean to put ultraviolet lighting when girls go up to dance. I know that at the creation there was no artificial light (ultraviolet). Bizhus Schloseth Avot. Next week, Parashat Va’Yetze we come to chapter 29 verses 10-11 in Bereshit. Ya’akov kissing a strange girl in full daylight in public! What happened to him? Or is it “what happened to us”. Now let us imagine what a quiet world it would be, no male and no female voices. Maybe not just as quiet as that, as musical instruments could be played – until someone comes and forbids them as well. Should someone with a beautiful beard shave it off? We don’t learn any halachos except Sheva Mitzvos (or Shesh) from B’Reishis. We do find Ervah by males. Shulchan Aruch says explicitly that if males are Choshud, then there is Yichud. In today’s age, where “people come out” should we ask them if they are homosexual and assign them separate rooms? There is an existential reality. This doesn’t mean it’s absolute, but it’s Ruba, D’Ruba. Darko Shel Ish Lachzor Achar Isho. Is it, as you said, homosexual reasons, or is the Rabbi worried about the women? Now each picture of a woman will have to state if she is married or single. Please note: Mitpachat, not a wig.